The Toys R Us that is located on 130 East El Camino in Sunnyvale, California about thirty miles from San Francisco is said to be the site of a ghost haunting. The 60,000 square foot northern California toy store, built back in 1970 was originally a massive orchard in the 1800’s that sat on a ranch. It was said to be owned by a man called Martin Murphy Jr. Other reports have him as a John Murphy Jr.
Murphy Jr. was looking to employ a farmhand to work on his large ranch. He hired a young immigrant from Scandinavia whose name was Johnny Johnson or Johan Johnson. This young man who was a minister at the time began working on the ranch and shortly after, fell in love with one of Murphy’s daughters. The daughter that he was infatuated with was Elizabeth the eldest daughter and they referred to her as Beth. Johnson never revealed his true feelings to Beth and was completely devastated when he realized that she had accepted a proposal from a successful Boston lawyer. The couple eventually moved to Massachusetts. Some time after, Johnson became infected with encephalitis which is a viral infection of the brain. He continued to work on the ranch and in 1884, Johnson cut his leg while he was chopping wood with an axe. Nobody was around for him to summon help from and Johnson died due to extensive blood loss. It is said that Johnson still roams the aisles of Toys R Us thinking that he must continue to earn his keep on the ranch and that if he does, Beth will eventually come back where he can finally reveal his true feelings for her. Several people including employees and customers have claimed to have witnessed paranormal activity at the Sunnyvale toy store. Toys inexplicably fall off shelves. There are times when a faint odor is quite distinct. The temperature has dropped in certain sections of the store which can’t be accounted for. The taps in the women’s rest room turn on by themselves and water will come pouring out with no explanation. People have claimed to be touched when nobody is there. Women have felt fingers going through their hair. Still others have heard someone knocking or even walking around the store when no one can be accounted for. It might just be Johnny Johnson who firmly believes that Beth will one day return to the ranch and he can claim his love. A police psychic, Sylvia Brown was called in and she conducted a seance in the store which was attended by many reputable people. 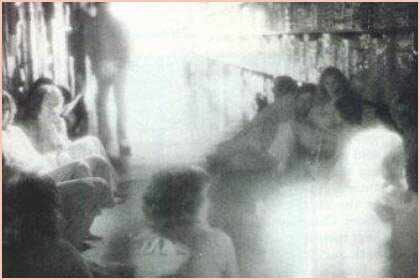 The photograph taken and shown above may represent the best photographic evidence of a ghost ever impressed on film. camera shooting the same isle at the same time showed a distinct and substantial image of a man standing in the isle, precisely where Sylvia said he was. Sometimes he would pace back and forth, or lean against a non-existent wall, or even appear to ascend steps that do not exist in our time-frame. But he was definitely captured on the special film with a simultaneous record of nothing at all on the standard film.